Originally conceived as a company specializing in the marketing of parts and spare parts for vehicles, Insert Auto Service was subsequently turned in the supplier of complete solutions of transport goods, so as a on the market for international transport as a trusted partner, flexible, made up of a team of professionals. Insert Auto Service is a company in rising, which offers its customers high quality services, efficient and cost-effective by constant efforts to improve vocational training and innovation in fleet and the technologies used. 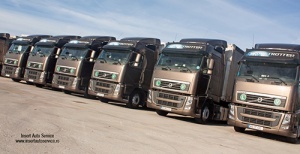 Along the time due to the large number of requests, we were forced to evolve, at which time the exponential growth in the fleet has proved to be a necessity to keep pace with developments in the business environment and to keep the standard quality, receptiveness and flexibility of the company. Today, we bring that a company broom, always close to its clients with complete solutions of transport goods, adapted to the needs of each of our customers. Thanks to our experience in the over 20 years of the international transport of goods and the professionalism we conducted this activity we have long-term contracts concluded with the various clients in the country and abroad. The main activity of transport includes the international carriage of goods by road and the internal complementary transport, operations carried out in accordance with the provisions of the CMR Convention.